The project aims are to provide education opportunities for girls in Sayla who were once deprived of this right. We also aim to create a learning environment for all students in the Sayla district filled with enthusiasm, creativity, healthy competition, mutual respect and trust. Teachers should be trained in modern teaching techniques to make classes more interactive, interesting, practical and thought-provoking. Parents should be engaged to encourage education. Together we can uplift education and uplift society. Sayla district had very limited education opportunities for girls especially. It was through the inspiration of Param Pujya bapuji that 'Shree Ladakchand Manekchand Vora (LMV) Girls High School was established in 1997. Since then the support for education by the Ashram has grown to include the 128 schools in Sayla district with over 25,000 students and 860 teachers through the 'Prem ni Parab' project. The project aims to create a learning environment for students filled with enthusiasm, creativity, healthy competition mutual respect and trust. Teachers are trained in modern teaching techniques to make classes more interactive, interesting, practical and thought-provoking. Parents are engaged to encourage education. The results speak for themselves: student drop-out rates have falled to historic lows, exam results have markedly improved and the number of students entering higher education has increased. In 2007 LMV College was established in Sayla. The College collaborates with the University of Saurashtra to offer higher education opportunities to 300 young women. A meeting with Param Pujya Bhaishree in 2004 became a cornerstone in my life, and the relationship I had formed with Raj Saubhag Ashram from Param Pujya Bapuji’s era flourished. Pujya Bhaishree had an intense desire to bring about a dramatic transformation in the education of our children in Sayla. Under his divine shelter, the ‘Prem ni Parab’ project was born. At that time, I was the Principal at Vadhavan Gharshala (High School). ‘Prem ni Parab’ represented the need of the hour -to bring about change in primary education was necessary but would not be easy considering the ingrained mental models existing within those in the education sector. It was difficult to dedicate enough time to the project but Pujya Bhaishree offered me the opportunity to manage the educational activities undertaken by the Ashram and I promptly accepted. Leaving my stable and well paid job, in 2005, I devoted myself fully to the cause. Nine years have passed by in service and I have now worked with 30,000 students and 850 teachers. I feel completely satisfied with my vocation, as it is only human to like seeing positivity spread. Any activity done with sincere efforts and dedication of the mind is bound to reap rich dividends. Today my heart brims with joy when I see the love that the students, teachers and parents harbour towards the ashram. Apparent transformation can be observed in many of the teachers associated with this project. 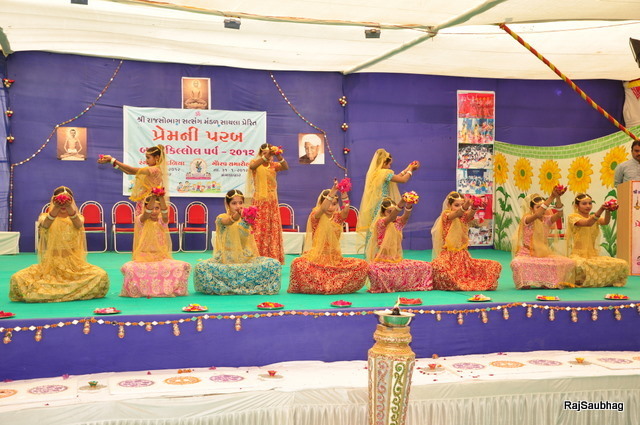 They attend workshops conducted by “Prem Ni Parab” with positivity and respect and knowledge and training given through this program has been well implemented by them. Working in an environment that is devoid of opposition, argument, and negativity only further inspires new thoughts, new initiatives and new programmes. It is a privilege to be friends with 30,000 primary school students and 800 teachers from 128 such schools. Every programme of ‘Prem ni Parab’ comes packed with something new and innovative and is immensely beneficial. Pujya Bhaishree, Br Vikrambhai and Br Minalben’s faith in me increases my responsibility manifold and I truly feel blessed in imbibing values like sincerity, dutifulness, morality, love and oneness in my life. The satisfaction of doing a good job keeps the fatigue at bay. I have now developed enormous faith in Pujya Bhaishree’s magnanimous vision, far-sightedness, and the ability to appraise a person. I have a desire to work for this Ashram for as long as I can, it is indeed my good fortune to be associated with such a beautiful and fulfilling job. I feel really proud to have been a catalyst in bringing about a positive change in the education sector.